Figure 1. Big Smoky South. Google Earth image showing the location of RLC's placer mining claims, with the evaporation ponds of Albemarle Corporation's Silver Peak Lithium Operation to the lower right. 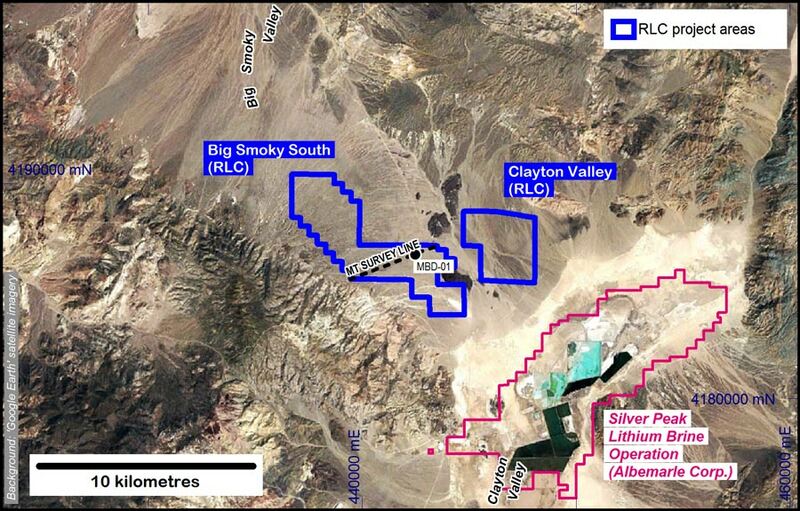 Big Smoky South Project is located 10 kilometres northwest of the Silver Peak lithium operation where the southern end of Big Smoky Valley meets the western side of Clayton Valley (Nevada, USA). This northwest striking valley is defined by a series of major northwest and north east faults. Based on USGS open file gravity data there is a discrete sub-basin in the centre of the valley with more than 2.4 kilometres of subsidence. In addition to the extensive Tertiary volcanic deposits in the area there are significant deposits of volcanic ash in the valley that in places are more than 30 metres thick. These ash deposits are considered by the Company to have come from the same volcanic eruptions that deposited similar ash deposits considered a source for the lithium in the brines being processed by the Silver Peak Lithium Brine operation. The ash deposits are capped by very recent basalt lava flows and cinder cones. The presence of recent volcanism is considered to be an important heat source for driving geothermal activity which can dissolve lithium from the volcanic ash beds and circulate it in ground water convection cells. Drilling conducted during 2018 (drill hole MBD-01) terminated at a depth of 401 metres after intersecting a thick sequence of lake sediments which the Company interpreted as being beneath the geological horizons that are prospective for lithium bearing brines. Pump testing and sampling of four selected zones was attempted in MDB-01, including in a zone of volcanic ash layers intersected between 59 and 100 metres down hole depth from surface. However, fluid flow rates were too low to allow effective sampling (ASX 30 July 2018 ).